This week it’s been all Robert Moses all the time. I have been rereading Robert Caro’s epic 1200 page biography, The Power Broker, and have been to all three parts of the exhibition “Robert Moses and the Modern City” curated by Columbia architectural historian Hillary Ballon. Yesterday I went up to Columbia’s Wallach Art Gallery and saw “Slum Clearance and the Superblock Solution” and then walked crosstown to The Museum of the City of New York for “Remaking the Metropolis.” Today I rode the #7 train to the Shea Stadium stop and visited the Queens Museum where workers were putting the finishing touches on “The Road to Recreation” which will open on Sunday. All this in preparation for my March Metropolis column which I should be writing at this very moment. While I strongly urge you, if you have any interest in New York City’s history or if you are the least bit geekish about infrastructure, to see all three parts of this exhibition, I think you should make a special effort to get to the Queens Museum. Why? Well, for one thing they’ve done a beautiful job telling their segment of the story, the part about the beaches, swimming pools, playgrounds and highways built by Moses. 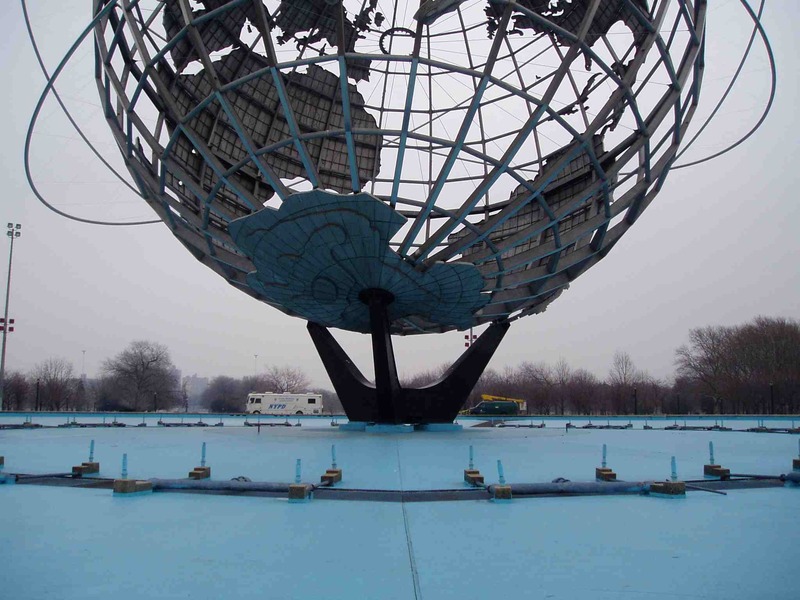 But the main reason is that the Queens museum is in Flushing Meadows Park, the site of the 1939 and 1964 World’s Fairs. Before Moses came along to landscape it and criss-cross it with his highways, it was a steaming ash heap. The museum sits right next to the Unisphere, the symbol of the 1964 fair, one of Moses’s last monumental achievements. And it’s home to the New York Panorama, a scale model of the whole city, commissioned by, you guessed it, Robert Moses. It’s hard to imagine a spot more redolent of Moses….unless, of course, you feel like taking a drive on the Cross Bronx Expressway. SPRING 1964: MOST WANTED MEN AT THE WORLD’S FAIR. Andy Warhol’s Thirteen Most Wanted Men is displayed on the side of the New York State Pavilion at the 1964 Worlds Fair in Flushing Meadow. 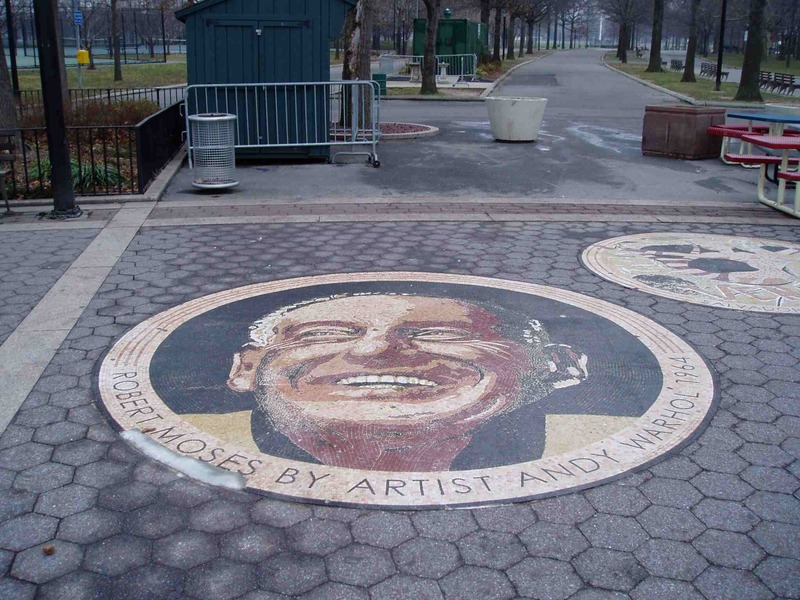 Warhol blamed Robert Moses, the city’s planner and president of the 1964-65 World’s Fair. Warhol proceeded to silkscreen twenty-five identical portraits “of a ferociously smiling Moses” to use as a substitute for the “most wanted men”. Philip Johnson rejected the idea, not wishing to offend the festival’s president.